A Green Line train on Huntington Avenue. For straphangers tired of broken-down trains on the Green Line, there’s an eventual end in sight: The MBTA plans to purchase new Green Line trains, to be delivered by 2021. 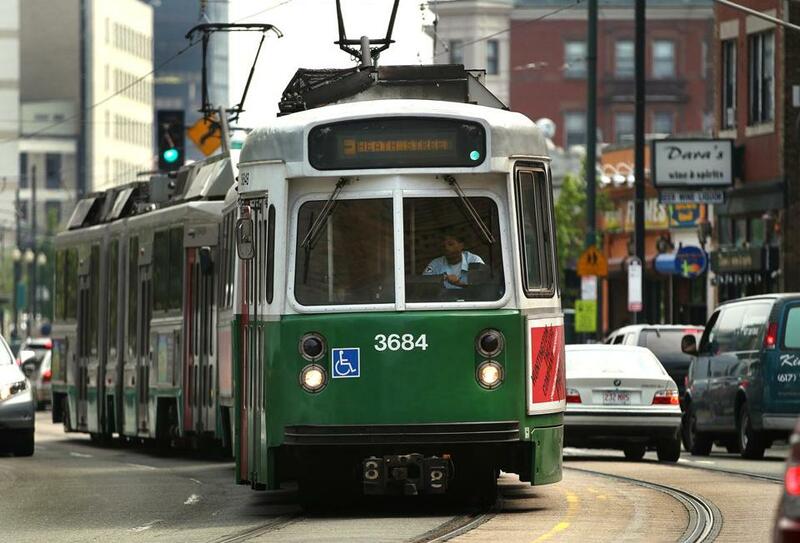 The new trains and other imminent transportation investments were revealed Thursday in the Massachusetts Department of Transportation’s five-year capital plan, a 65-page document that outlines how state officials plan to spend billions on big-budget projects. The most significant projects listed have long been known to be priorities for transportation officials: new trains for the Red and Orange lines; a project to straighten the Massachusetts Turnpike in Allston to alleviate traffic; reconstruction of the I-93/I-95 interchange in Canton and the I-91 viaduct in Springfield; extending the Green Line into Somerville and Medford; and overhauling the Registry of Motor Vehicle’s techonology system. But the plan also offered some new details, including the project to buy new Green Line trains. In the next five years, MassDOT officials plan to spend $2.6 million for the planning and design of the trains. More money will have to be spent to meet MassDOT’s goal of delivering the trains to Greater Boston by 2021. In total, the plan listed $12.4 billion in expenditures from state and federal coffers that transportation officials plan to make in coming years; 53 percent of that money would be spent on highways and 25 percent on the Massachusetts Bay Transportation Authority. The plan does not allocate all of the funding necessary to make the plans a reality. For example, the plan earmarks $254 million for the controversial South Coast Rail project, which would connect Boston with Fall River and New Bedford, but that money would go only toward initial design, permitting, and planning costs, and improvements to accommodate later passenger service. Those moves might bring the rail closer to fruition, but don’t guarantee that passenger service would be funded under a new governor. The expansion of South Station to accommodate more train tracks, a project that has long been promoted as integral to the region’s development, will cost $200 million over the next five years — but that’s only a little more than one-fifth of the total price tag. According to the capital plan, officials are hoping to bolster the budget for that project with $700 million from public-private partnerships — a tall order that would require MassDOT to step up its game in luring high-profile companies into pacts to help pay for transit projects. The capital plan also calls for $252 million to be spent on an extension of the Silver Line to Chelsea and the purchase of diesel-multiple units, smaller and more efficient train cars that can make more frequent stops on commuter rail lines, intended for the Fairmount Line, which runs through Dorchester, Hyde Park, and Roxbury. Officials intend to spend $130 million on bicycle facilities and improvements to existing bike paths. But, he continued, the projects outlined in the plan are dependent on current projections of state funding. If efforts are successful to repeal the automatic gasoline tax hikes in a November ballot question, the resulting lower tax revenue could derail some of the transportation projects.